The Spanish Civil War was a romantic lost cause and continues to attract writers’ attention since the days of Ernest Hemingway, who drove ambulances on the rebel side, while conjuring story lines for his novel. Telling the tale from a women’s perspective is still unique all these decades later. 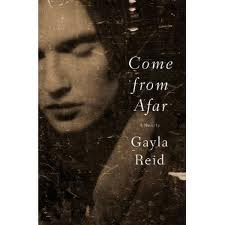 BC writer Gayla Reid’s fills this gap admirably with her novel, ‘Come from Afar.’ Reid—originally from Australia and one of the founder’s of the Vancouver literary journal, Room magazine–has created a multi-dimensional character in Clancy Cox. The fishing village becomes an important touchstone in Clancy’s psyche and provides a central stage for much of the hardships ahead. She is abruptly widowed and when civil war breaks out between the fascists and the rebels in 1936, she throws herself in to the ‘cause,’ volunteering as a nurse. Clancy is an ally to the male volunteers who pour in from around the world and form brigades to fight Franco’s soldiers, financed by Hitler and Mussolini. Weary from a four year European war and economic depression, the world’s democracies passively watch on. The reader is made aware of bloody skirmishes, aerial bombings and political intrigues, but much of the war is reflected in make-shift hospitals, where Clancy labours to help the wounded and dying. She believes in her own healing powers as she faces the greater losing battle. Clancy also meets other stoic doctors and nurses, and even the cellist Caslos, who comes to play for the patients. She describes his powerful music: ‘A melody edges on into the strangeness of things, coming at last to an open place that sounds like joy and sorrow fused, nothing less.’ At the hospital she also finds her true love, Douglas Ross, a soldier from New Westminster, BC and a member of the Canadian brigade, the Mackenzie-Papineau Brigade (the ‘Mac-Pacs’). More complications of the heart are ahead. Actual nurses’ accounts were researched by the author, producing compelling details as Clancy describes her work: ‘The afternoon brought more stomachs, legs, arms, hands. And the worst, the head injury cases. By the end of my shift, forty-nine men had been classified.’ The author also read widely about this pivotal four year civil war, as indicated in the historical notes and bibliography. Expect graceful storytelling, with only subtle references to historical fact. The reader is carried ‘afar’ with Clancy, embarking on valuable experiences and promise of the ‘lights of home’ at journey’s end. This entry was posted on March 1, 2012 at 3:18 am and is filed under Book Reviews. You can follow any responses to this entry through the RSS 2.0 feed. You can leave a response, or trackback from your own site.